Corry Starling will be giving a slide show presentation which will cover the history of the mill, how the machinery works, the difference in the flours they produce, what they will be doing in the future and a brief explanation about the Archimedes turbine adjoining the mill. “I have been involved with country estates for over 20 years and spent a period of time working for The National Trust. My wife and I moved to Mapledurham village in 1999 and were going to stay for about 18 months and we are still here. I started to do some work for Mapledurham Estate about 7 years ago which involved helping in the watermill. In 2012 my wife and I had the opportunity to take on Mapledurham Watermill, we now rent the watermill and gift shop from the Estate and I am the principal guide for the private tours of the Manor House and mill. 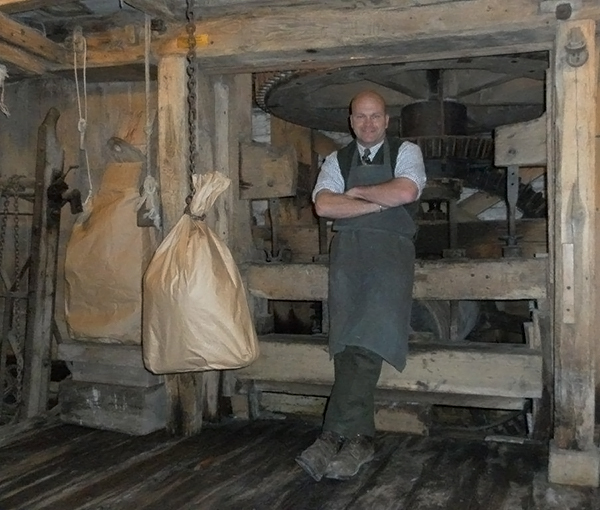 Mapledurham Watermill is now the last commercially working watermill left on The River Thames . There has been a watermill at Mapledurham for over a 1000 years”.